Partly to mostly cloudy. Low 57F. Winds S at 5 to 10 mph.. Partly to mostly cloudy. Low 57F. Winds S at 5 to 10 mph. ROCK HILL -- Mr. Lee Galphin Smoak Jr. of 1330 India Hook Road, Rock Hill, passed away on Tuesday, March 12, 2019. Mr. Smoak was the son of the late Lee Galphin Smoak Sr. and the late Emily Hungerpiller Smoak of Orangeburg, and was the widower of Lydia Ardrey Smoak, who passed away in 2016. Mr. Smoak was 93 years old, born on July 25, 1925, in Orangeburg. He was educated in the Orangeburg city schools and was a graduate of The Citadel in Charleston, from the class of 1948 with a bachelor of science degree in business administration. During his sophomore year at The Citadel, he was drafted into the Army in December 1943. He served more than 2-1 years in the China-Burma-India Theater of operations during World War II. He entered the service as a private and rose to the rank of first lieutenant, serving in the Army Reserves for a short time following the war. Among his awards were the Combat Infantry Badge, the Bronze Star Medal, the Asiatic-Pacific Campaign Ribbon with four battle stars, and the Good Conduct Medal. Following his military service, he returned to The Citadel to complete his education. During his working career, he was associated with Dan River Mills, Deering Milliken and Co., The Terrell Machine Company and Schlafhorst Inc. in Charlotte. During the early 1970s, he and his wife, Lydia, were among the founding charter members of Sharon Baptist Church in Charlotte. He served several terms as deacon chairman and was a member of the board of trustees. He retired in 1991 and moved to Rock Hill in 1998. Mr. Smoak was very active in the Rock Hill Citadel Club, the Kiwanis Club of Rock Hill, and Westminster Presbyterian Church, where he served as a deacon. He was an avid Citadel supporter and, over the past years, he recruited more than 65 young cadets to attend The Citadel. During the past few years, he mentored a number of cadets and was adopted as their “surrogate grandfather.” He continued to be their mentor after graduation along with several members of the Armed Forces. Mr. Smoak is survived by his sons, William Lee Smoak and wife Julie of Charlotte, N.C., and Dr. Charles Kelly Smoak and wife Beth of Fort Mill; his grandchildren whom he adored, Grace, Kathryn, Caroline, William, Margaret and Jonathan. Celebration of life service will be Saturday, March 16, at Westminster Presbyterian Church, 1320 India Hook Road, Rock Hill, with the Rev. Dr. Shelton Sandford III and the Rev. Dr. Mike Honeycutt officiating. Visitation with the family and friends will be from 6 to 7:30 p.m. Friday, March 15, at Greene Funeral Home Northwest Chapel, 2133 Ebenezer Road, Rock Hill, and following the service on Saturday in the Anne Burns Sandford Parlor at the church. Burial will be private with military honors. In lieu of flowers, memorials may be made to the Lee G. Smoak Jr. Scholarship Fund at The Citadel Education Foundation, 171 Moultrie St., Charleston, SC 29409. Condolences may be made online to greenefuneralhome.net. ORANGEBURG -- Todd Charles Livingston, 50, of Orangeburg, passed away on Monday, March 11, 2019. Todd was born on Aug. 17, 1968, in Orangeburg. He was the son of Gale Bauerle Livingston and the late Charles L. Livingston. He graduated from Orangeburg-Wilkinson High School and attended Orangeburg-Calhoun Technical College, studying mechanical drawing. Todd was predeceased by his maternal grandparents, Herbert and Edna Bauerle; his paternal grandparents, Wilbert and Nan Livingston; and his uncle, David Bauerle. Survivors include his mother, Gale Livingston of the home; sister, Geri Wood of Orangeburg; brother, Jason Livingston of Orangeburg; niece, Abigale Grace Wood of Oklahoma; great-nephew, Oliver Wood of Oklahoma; uncle, Bruce (Connie) Bauerle of Texas; and aunt, Sunny Forrest Bauerle. Memorials may be made to the Church of the Redeemer, 1606 Russell St., Orangeburg, SC 29115. The family would like to thank Todd's caregivers, Joyce Smith, Jessica Stevenson and Drucilla Green for all of their love and support. BRANCHVILLE -- Lucille Walker, 91, of 103 George St., Branchville, died Tuesday, March 12, 2019, at the Regional Medical Center in Orangeburg following a prolonged illness. Friends may call at the residence and Owens Funeral Home of Branchville. HOLLY HILL -- Mr. David James, 74, 539 Caufield Court, Holly Hill, transitioned Tuesday, March 12, 2019, at the Regional Medical Center in Orangeburg. Funeral arrangements are incomplete. Friends may call at the residence and Shuler-Marshall Funeral Home of Holly Hill. CORDOVA -- Patricia Cook Smith, 66, of Cordova, passed away Monday, March 11, 2019, at the Regional Medical Center in Orangeburg. Thompson Funeral Home Inc. in Orangeburg is assisting the family. She was born Jan. 9, 1953, in Orangeburg, the daughter of the late James H. Cook and the late Mildred Hoover Cook. She was a member of Columbia Road Church of God and was a former employee of St. Paul's United Methodist Church Daycare. Survivors include her two sons, Christopher David Smith and Richard Coy Smith, both of Cordova; one granddaughter, Abby Rae Smith of Summerville; a brother, Bobby Cook of Orangeburg; an uncle, Homer (Rosie) Hoover of Summerville; an aunt, Helen (Willie) Chavis of Cordova; and a number of nieces, nephews and cousins. ORANGEBURG -- Geraldine B. Craven, 85, of Orangeburg passed away peacefully at her home on Monday, March 11, 2019. A memorial service will be held at 3 p.m. Friday, March 15, at Northside Baptist Church in Orangeburg. The Rev. Dr. Shane Stutzman will be officiating. The family will receive friends from 2 to 3 p.m. Friday prior to the memorial service. Mrs. Geraldine was born on Feb. 15, 1934, in Augusta, Ga. She was the daughter of the late Dozier A. Bohler and the late Jewell Bunch Bohler. She was a member of Northside Baptist Church and was retired after 26 years of service from the Regional Medical Center. She was predeceased by her husbands, Sammie Lee Griffis and Jeremiah Craven Sr.; her son, Sammy Griffis; and her grandson, Adam Griffis. Survivors include two daughters, Jewel G. Milhouse (Theo) of Orangeburg and Doris G. Glover (Thomas) of Williston; eight grandchildren; 20 great-grandchildren; a brother, Douglas E. Bohler (Frances) of Murrells Inlet; a daughter-in-law, Barbara G. Prince of Prattville, Ala.; stepsons, Pat Craven and Jerry Craven; an adopted sister, Lillie Hall; a special niece, Betsy Eubanks; and a number of nieces and nephews. The family would like to give a special thanks to Jennifer, Katelyn, Melody, Chaplain Dexter and Trinity Hospice for their love and support. Friends may call at the residence of Mr. and Mrs. Theo (Jewel) Milhouse. Memorials may be made to Northside Baptist Church Vacation Bible School, 1250 Columbia Road, Orangeburg, SC 29115, or to Trinity Hospice, 690 Medical Park Drive # 400, Aiken, SC 29801. NORTH -- Mr. Terry Leon Gaffney, 58, of North passed away Thursday, March 7, 2019. A memorial service will be held at 3 p.m. Thursday, March 14, at Gaston First Baptist Church, 121 Oakey Springs Drive, Gaston. He was the son of the late Cleo Gaffney and Hattie Lou Culler Gaffney. He is survived by his son, Robert Gaffney; daughter, Tasha Gaffney; former wife, Robin Gaffney; and many loving relatives. Memorials may be made to Dorn VA Medical Center, 6439 Garners Ferry Road, Columbia, SC 29209, Attn: Voluntary Service or Gaston First Baptist Church Culley Fund. W.B. Crumel Funeral Home of North is assisting the family. BRANCHVILLE -- David Todd Summers, 56 years of age, died Saturday, March 9, 2019. Todd was born in North Carolina, a son of Frederick “Doc” Summers and the late Jacqueline W. Summers. He loved driving trucks and playing with his cats. A memorial service will be held at 2 p.m. Saturday, March 16, at Hunters Chapel Baptist Church, with the Rev. Alvin Jeffcoat and the Rev. Jakie Walters officiating. The family will receive friends from 1 to 2 p.m. at the church, 9375 Hunters Chapel Road, Bamberg, SC 29003. Survivors include his father; one daughter, Lauren Summers of Arkansas; two brothers, Mark Summers of Orangeburg and Steve Summers of Branchville; and a number of nieces and nephews. In lieu of flowers, memorials may be made to Ott Funeral Home, P.O. Box 96, Branchville SC 29432. Online condolences can be made at www.ottfh.com. Lynn Van Benschoten -- Louisa, Va.
LOUISA, Va. -- Lynn Van Benschoten, 79, of Louisa, Va., 23093, a retired farmer, died March 3, 2019, in Louisa. Mr. Van Benschoten was born in Stanfordville, N.Y., the son of Chester and Dorothy Van Benschoten, and was the widower of Ellen Gleaton Van Benschoten. Survivors include sons, Brian (Tammy) of Mineral, Va., Daniel Van Benschoten of Fredericksburg, Va.; daughter, Mia Van Benschoten of Columbia; and grandchildren, Chet and Seth Van Benschoten. Funeral home services for Lynn are being provided by Cremation Society of Virginia -- Richmond of Richmond, Va.
ORANGEBURG -- Mrs. Mary Ann Brunson Fogle, 72, of 241 George St., Orangeburg, passed away Tuesday, March 12, 2019, at Edisto Post Acute Care of Orangeburg. Funeral arrangements are incomplete and will be announcec later. Friends may call at the residence of her daughter, Mrs. Shameka Guest, 110 Tyke Court, Orangeburg, or Simmons Funeral Hoem and Crematory of Orangeburg. ST. MATTHEWS -- Mr. Randolph "Randy" Lykes of St. Matthews passed away Monday, March 11, 2019. Friends may call at the residence of his brother, Jasper Lykes, 179 Howell Lane, St. Matthews, and the funeral home. BLACKVILLE – The funeral for Mrs. Shirley Kirkland will be held at 2 p.m. Thursday, March 14, 2019, at Mount Zion Baptist Church, Lees. Burial will be in Hope Memorial Park Cemetery, Barnwell. Mrs. Kirkland passed away Saturday, March 9. Friends may call at the residence at 8658 Highway 70, Blackville, and at the funeral home. SPRINGFIELD -- Funeral services for Lewis Donald “Donnie” Williams, 85, of Springfield, will be held at 2 p.m. Thursday, March 14, 2019, at Dean Swamp Baptist Church with the Reverends Henry Cooper and Milford Oswald officiating. Burial will be in the Williams Family Cemetery, Springfield. The family will receive friend from 6 to 8 p.m. Wednesday, March 13, at Folk Funeral Home, Williston. Memorial contributions may be given in Mr. Donnie's memory to Dean Swamp Baptist Church, P.O. Box 567, Springfield, SC 29146. He passed away on Monday, March 11. Born in Orangeburg County, he was a son of the late Jacob Lowman Williams and Blanche Knight Williams and was married to the late Barbara Dyches Williams. He was a graduate of Springfield High School, enjoyed boating, spending time at the beach and loved to watch baseball. In 1987, at the age of 54, he retired from E.I. DuPont, where he worked as an electrician and a mechanic. Mr. Donnie was a member of Dean Swamp Baptist Church and served for nine years in the S.C. Army National Guard, where he obtained the rank of SPC 5. Survivors include his children, Robert D. “Don” (Patty) Williams of Jacksonville, Fla., Cyndi (Eddie) Reed, Julie (James Ray) Gartman, all of Springfield; grandchildren, Meghann (Ken) Bullard, Matthew (Cameron) Williams, Torie (Brent) Douglas, Allyson (Russ Hamilton) Gartman, Taylor McLeod, Jason Williams, Jesse Williams; great grandchildren, Nathan Williams, Gavin Bullard, Sawyer Bullard, Charlie Williams, Jason McLeod, Abram Douglas and Judah Douglas; step-great-grandchildren, Tyler, Chase, Tucker, Hayden and Annabelle; numerous nieces, nephews and cousins. He was preceded in death by his son, Charles Russell “Rusty” Williams; his sister, Nina W. Smith; and a brother, Ernest Howell “Bubba” Williams. The family would like to thank Nuclear Care Partners and Staff; Hillary, Rena, Deanna, Anita and all of the doctors, nurses and staff at Providence and Heart Strings Hospice for all of the love, care and concern that they have shown to Mr. Donnie and his family during his illness. Folk Funeral Home Inc. and Crematory, Williston, is assisting the family with arrangements. Visit our on-line registry at www.folkfuneralhome.com. ST. GEORGE -- The funeral service for Mr. Isaac "Peck" Rush Jr., 84, of 905 Duke St., will be held at 1 p.m. Thursday, March 14, 2019, at Lovely Hill Baptist Church, 639 Hesseman Ave., Holly Hill, with the Rev. W.J. Frierson, pastor, officiating. The casket will be placed in the church at noon. Burial will follow in the church cemetery. Visitation is scheduled from 3 to 7 p.m. Wednesday, March 13, at Williams Funeral Home of Elloree. Friends may call at the residence of Ms. Rose Waymer, 119 Onyx Way, Holly Hill, and the funeral home. Online condolences may be sent to info@williamsfuneralhomeofelloree.com. ST. GEORGE -- Steg Kelly, 83, of St. George, passed away Saturday, March 9, 2019. Wake service will be held from 6 to 8 p.m. Thursday, March 14, at the funeral home. The funeral service will be held at 11 a.m. Friday March 15, at Shady Grove United Methodist Church, 9221 Charleston Highway, St. George. Burial will be held at the church cemetery. The casket will be placed in the church at 10 a.m. Arrangements are by Brown & Son Funeral Home, 5901 W. Jim Bilton Blvd., St. George (843-563-4332). ORANGEBURG -- Mrs. Orianne Elise Bowers, 66, of 4326 Cricket Drive, Orangeburg, passed away on Tuesday, March 12, 2019, at her residence. Friends may call at the residence of her husband, Mr. David Bowers, 4326 Cricket Drive, Orangeburg, or Simmons Funeral Home and Crematory of Orangeburg. ROCK HILL -- The funeral for Mrs. Lillian Daniels Haynes, 65, of 490 Alysia Court, Apt. 203, Rock Hill, will be held at 1 p.m. Wednesday, March 13, 2019, at Exodus Baptist Church, 2431 Charleston Highway, Orangeburg, with the Rev. Aubrey Brown, pastor, officiating. Mrs. Haynes passed at home on Wednesday, March 6, 2019, following a brief illness. Friends may call at Bethea's Funeral Home. ELLOREE -- Mrs. Thomasiener Caldwell Johnson, 64, of 185 Batan Ct., Elloree, passed away on Sunday, March 10, 2019, at Prisma Health Richland, Columbia. Friends may call at the residence of her brother, Bernard Caldwell, 185 Batan Ct., Elloree, or Simmons Funeral Home and Crematory of Santee. EUTAWVILLE -- Mr. Patrick Allen Brown, 35, of 13110 Old #6 Highway, Eutawville, passed away Sunday, March 10, 2019. Friends may call at the residence of his sister, Cynthia Stokes, 497 Brim St., Santee, or Simmons Funeral Home and Crematory of Santee. BARNWELL -- Thomas L. Jordan, 79, of 36 Wingo Estate Road, died Monday, March 11, 2019, at Pruitt Health Care of Aiken. Funeral services will be announced at a later date by the Denmark Chapel of the Carroll Mortuary. ST. GEORGE -- Steg Kelly, of St. George, passed away on March 9, 2019, at Colleton Medical Center. VANCE -- Eva M. Elmore, 65, of 126 Oregon St., died March 10, 2019, at Edisto Post Acute Care, Orangeburg. ORANGEBURG -- Karen was born the oldest of four sisters. Raised in Phoenix, Arizona, she attended Arizona State University where she obtained her bachelor's degree in education. She married her husband after they met working together in the same café where she was a waitress and he was a cook. They had two sons and moved to South Carolina, where they were house parents for the Connie Maxwell Children's Home in Orangeburg for 18 years while she continued to teach in the public schools and earned her Master's Degree from South Carolina State University. After retiring, she and her husband focused on gardening, traveling and spending time with friends and family. She is a born-again Christian and has been a great witness to God's providence. Her actions in life exemplify the love of Christ. Karen is survived by her husband of 51 years, James Zimmer; sons, Eric (Alisha) Zimmer and Edward (Rachael) Zimmer; granddaughter, Ashlyn Zimmer; sisters, Darla (Ron) Straub and Mary (KC) Seidner; in-laws, Jo Ann (Larry) Brewer and David (Jane) Hutcherson; and a number of loved nieces and nephews. A memorial service will be held at 11 a.m. on Thursday, March 14, 2019, at St. George Baptist Church in Orangeburg. Visitation will immediately precede the service, starting at 10 a.m. at the church. In lieu of flowers, memorials can be made to Child Evangelism Fellowship (CEF). ORANGEBURG -- Annie Rose “Rosie” Furtick, 92, of Orangeburg passed away peacefully at her home on Thursday, March 7, 2019. Mrs. Furtick was born on July 21, 1926, in Swansea. She was the daughter of the late John H. Williams and the late Gladys Livingston Williams Culler. She was retired from Ethyl Albemarle where she served as an Executive Secretary. Rosie loved spending time at Santee, enjoyed nature, and starting her day with a cup of hot tea and the local newspaper. Mrs. Furtick was predeceased by the love of her life, Cancy Salley; and her brothers, Charles Williams and Jimmy O'Neal “J.O” Williams. Survivors include her son, Robert “Bobby” Charles Furtick of Charleston; grandson, Robert Charles Furtick Jr. of Columbia; daughter-in-law, Maria Furtick of Columbia; children, Frank (Linda) Salley of Middleburg, Virginia, Susan Salley of North Myrtle Beach; brother, William “Bill” (Cathy) Williams of Simi Valley, California; and a number of nieces and nephews. The family would like to express sincere thanks to Rosie's caregivers, Ms. Monique Jones and Ms. Lillie Jones and the extended Jones family for their love and friendship. DENMARK -- Memorial services for Felicia Moody, 53, of 108 White Lane, Apt 6C, Denmark, will be held on Wednesday, March 13, 2019, at 1 p.m. in the chapel of Carroll Mortuary in Denmark. She died Sunday, March 10, 2019, at tRMC. Felicia Murdaugh Moody was born to James and the late Catherine Murdaugh of Denmark. Felicia held several jobs in Bamberg County until her health failed. Felicia is survived by her husband, Willie Lee Moody of the home. There are four sons, Samuel Murdaugh, Alfonso Murdaugh, Jordan Murdaugh and Quan Murdaugh, all of Denmark. There are three brothers, James Murdaugh Jr., Jason Murdaugh, both of Denmark, and Willie Martino of Spartanburg; and one sister, Jeanne Murdaugh of Brooklyn, New York. The Denmark Chapel of the Carroll Mortuary will be handling the services. Friends may call at the home of the father, James Clay Murdaugh, 97 Byrnes St., Denmark. 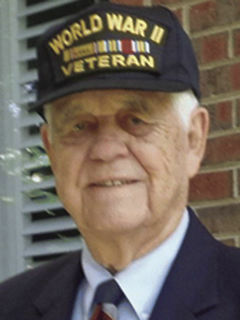 Dewey Edwards -- Virginia Beach, Va.
VIRGINIA BEACH, Va. -- Dewey Earl Edwards, 89, passed away on March 9, 2019. He was born in Creston, South Carolina, to the late Richard Earl and Rena Edwards. Dewey was a long-time member and Deacon of Four Holes Baptist Church. Left to cherish his memory are his wife, Betty Stroman Edwards; his daughter, Jan Matsoukas and husband, Bill; his son, Kevin Edwards; a sister, Joanne Cuttino; four grandchildren, Callie Elfman and husband, Fraser, Jonathan Gaillard and wife, Anna, Bailey Edwards Sutcliffe and husband, Hunter, and Emily Edwards; three great-grandchildren, Avery Elfman, Paige Elfman and Mason Lee Sutcliffe; and many extended relatives and friends. DENMARK -- Mr. Ruben Holmes, 77, of Denmark, died Thursday, March 7, 2019, at his residence. Funeral services are scheduled for 2 p.m. Wednesday, March 13, 2019, at Wright's Funeral Home in Denmark. Burial will follow at New Memorial Cemetery in Denmark. Mr. Holmes was born Feb. 11, 1942, to the late Gus Holmes and Bernice Paul. Survivors include three sons, Duane (Annette) Johnson, Brooklyn, New York, Kevin (Regina) Holmes, Orangeburg, Kenny (Eugenia) Holmes, Daly City, California; one daughter, Kimberly (Shawn) Haynes; 13 grandchildren; four great-grandchildren; one sister, Lovette Glascow; and a host of nieces, nephews, other relatives and friends. DENMARK -- Felicia Moody, 53, of 108 White Lane, Apt 6C, Denmark, died Sunday, March 10, 2019, at the Regional Medical Center. Friends may call at the home of the father, James Clay Murdaugh, 97 Byrnes Street, Denmark. ORANGEBURG -- Evelyn Horger Whisenhunt, 85, of Orangeburg, passed away on Friday, March 8, 2019, at the Regional Medical Center in Orangeburg. Mrs. Evelyn was born on March 31, 1933, in Orangeburg. She was the daughter of the late Franklin Horger and the late Dorothy Mitchum Horger, She was a member of St. George Baptist Church. Mrs. Evelyn was predeceased by her husband, William “Bill” Whisenhunt; twin sons, Ken and Khris Whisenhunt; grandson, Kevin Whisenhunt and a sister, Mary Horger Hunter. She is survived by sons, Lain (Becky) Whisenhunt, Andy (Connie) Whisenhunt, Larry (Lynn) Whisenhunt; daughter, Rene' W. Dunn; 12 grandchildren; 13 great-grandchildren; brothers, Charles (Kathleen) Horger and Gene (Mavis) Horger; and a number of nieces and nephews. The family will receive friends from 7 to 9 p.m. on Tuesday, March 12, 2019, at the home of Evelyn Whisenhunt. For any additional information, friends may call the home of her daughter, Rene' Dunn at 803-534-6229. EUTAWVILLE -- Rodney "Ronny" T. Tumbleston Sr., 75, of Eutawville, passed away March 8, 2019, at Pruitt HealthCare in Bamberg. Funeral services will be held 11 a.m., Wednesday, March 13, 2019, at Dukes-Harley Funeral Home Chapel. The family will receive friends following the service. Entombment will follow at 3 p.m. in the Magnolia Cemetery of Charleston. Ronny was born to Frances Drose Tumbleston and the late Elmore W. Tumbleston. He attended Porter-Gaud High School, Carlisle Military Academy, and then The Citadel Military College of South Carolina. After school he served a full term in the Army National Guard. He operated a number of businesses including an American Standard; later AMACO auto service station on Rivers Ave, Charleston; then settled in Eutawville as the owner and operator of Eutaw Auto and Marine Service Center for over two decades. He was predeceased by his wife Debbie Tumbleston. Survivors include his mother Frances D. Tumbleston of Orangeburg; two sons, Rodney T. Tumbleston Jr of Orangeburg, and Ricky Todd of Anderson; two daughters, Janice T. Jones of Covington, Georgia, and Anna Todd Smith of Anderson; five grandchildren, Ryan, Nicholas, and Lauren Jones of Covington, Georgia, McKayla Smith of Eutawville, and Quenten Smith of Anderson. In lieu of flowers, the family would encourage any gifts in memorial be made to the Orangeburg SPCA, PO Box 1506 Orangeburg, SC 29116 www.orangeburgspca.org or a charity of your choice. ROCK HILL -- Mrs. Lillian Daniels Haynes, 65, of 490 Alysia Court, Apt 203, Rock Hill, passed away at home Wednesday evening, March 6, 2019, following a brief illness. Funeral plans will be announced later by Bethea's Funeral Home. CAMERON -- James “Jimmy” W. Heape of Cameron passed away Saturday, March 2, 2019. Funeral services will be held at 11 a.m. Tuesday, March 12, at St. Matthews Lutheran Church, 1628 S.C. 6, Creston. Burial will follow in St. Matthews Lutheran Church Cemetery. Pastor Eric Little will be officiating. The family will receive friends from 10 to 11 a.m. Tuesday prior to the funeral service. Pallbearers will be Daniel Fogle, John Jones, Rusty Williams, Mark Mizzell, Jacob Mizzell and Breeze Fields. Mr. Heape was born Jan. 24, 1932, in Fort Motte in Calhoun County. He was the son of the late William Buyck Heape and the late Lynd Shirer Heape. He retired from the United States Army National Guard after 42 years of service. He also retired from Continental Grain. Mr. Heape was a member of St. Matthews Lutheran Church. He was predeceased by his wife, Frances Fogle Heape. Survivors include two daughters, Mary Lynd Heape of the home and Jamie McClellan (Bert) of Cameron; granddaughter Abbigail McClellan of Cameron; brother Frank Heape (Joan) of Orangeburg; sisters Betty H. Jones of Orangeburg and Emily Heape of Orangeburg; sister-in-law Patricia Heape of Elloree; and a number of nieces and nephews. Friends may call at his residence. Memorials may be made to St. Matthews Lutheran Church, 1628 S.C. 6, Creston, SC 29030. BLACKVILLE -- Mrs. Shirley C. Kirkland, 73, of 8658 Highway 70, Blackville, passed away March 9, 2019, at her residence. Funeral arrangements will be provided at a later date. Sacred arrangements are entrusted to the Dash's Funeral Home of Blackville. ORANGEBURG – Funeral services for Mrs. Mavis Ynether Sims-Jennings, 91, of 328 Tyler Road, will be held at 1 p.m. Monday, March 11, 2019, at Edisto Fork United Methodist Church, with the Rev. Ellis White Jr. officiating. Burial will be in Belleville Memorial Gardens. The casket will be placed in the church at noon. Mrs. Sims-Jennings died Monday, March 4, 2019, at the Regional Medical Center following a brief illness. Viewing will be held from 2 to 8 p.m. Sunday, March 10, at Glover's Funeral Home. NEESES -- Kathryn Elaine “Tootie” (Garrick) Cave, 78, passed away at 11:42 p.m. Friday, March 8, 2019, at Lexington Medical Center, surrounded by her family and friends. Funeral services will be held at 3 p.m. Tuesday, March 12, at Two Mile Swamp Baptist Church. Burial will follow in the church cemetery. The Rev. Dr. Cecil Cave will be officiating. Visitation will be held from 2 to 3 p.m. prior to the funeral service. Pallbearers include Thom Garrick, Tim Garrick, Todd Garrick, Tony Garrick, Devin Bair, Ward Davis, Jim Holstein and Don Duncan. Elaine was born Feb. 21, 1941. She was the youngest daughter of the late Henry Belton Garrick and the late Eden (Douglas) Garrick. Elaine and Blanchard were married on July 29, 1962. She graduated from Norway High School,Norway, in May of 1959. In that same year, she went to work for Covington and Smith Cotton Company and worked there until they closed. She then worked for North Commodities, North, for Milledge Jeff Holstein and A.L. Smith from 1981 until she retired in 1992. She was a member of Two Mile Swamp Baptist Church on Bonnette Road in Cope. She is survived by her husband, Alexander Blanchard Cave Sr.; four children, Penny Cave (Don) of Neeses, Alexander "Alec" Blanchard Cave (Lisa) of Neeses, Valerie Cave Strock (James) of North, and Janet Melinda Cave of Neeses; eight grandchildren -- seven are here, and Chrissy Kaylene Baughman is an angel in heaven; and sisters Jean (Garrick) Krewson, and Nancy (Garrick) Bair. She is also survived by a number of nieces and nephews, and a special friend, Sandra "Sookie" Hughes. She was preceded in death by a sister, Eleanor (Garrick) Adams Covert, and brothers, George Watson Garrick, John Parker Garrick and Henry Franklin Garrick. In lieu of flowers, Elaine would like contributions to be made to a cancer society of your choice. ORANGEBURG -- Funeral services for Mr. Steven L. Cureton, 48, of 142 Waycross St., Orangeburg, will be held at noon Monday, March 11, 2019, at Simmons Funeral Home and Crematory Chapel. Interment will be in Heavenly Rest Memorial Park. Elder DeBorah Jamison is officiating. Mr. Cureton passed away on Tuesday, March 5, 2019, at his residence. Visitation will be held Sunday, March 10, 2019 from 2 to 8 p.m.
Friends may call the residence of his mother, Mrs. Lillian McDaniel, at 142 Waycross St., Orangeburg or Simmons Funeral Home and Crematory of Orangeburg. ORANGEBURG -- The Rev. Charlie Haynes, 92, of 1426 Ridgewood Drive, died Saturday, March 9, 2019, at the Regional Medical Center following a brief illness. Arrangements are incomplete and will be announced later by Glover's Funeral Home. BOWMAN -- Albert W. Pendarvis, 66, a lifetime resident of Bowman, and retired sergeant of the Army National Guard, passed away peacefully at home on March 7, 2019, after an extended illness. Albert is survived by his high school sweetheart and loving wife of 47 years, Diane (Drawdy), his son Michael (Pendarvis) Hello and son-in-law Anthony Hello of New York City, his niece Stacy (Drawdy) Martin and her husband Robert Martin of Orangeburg, Stacy's son Larry James (LJ) Smith, and four siblings and their families. Throughout his life, Albert actively participated in the Bowman Southern Methodist Church community, including serving on its Board of Stewards, in the Cartwright Men's Fellowship, and at Adult Sunday School. Albert also led the tapes ministry program which brought audio of church services to community members who could not attend in person. Outside of the church, Albert was a member of the Confederation of the Blind, Toastmasters, and the American Legion. He positioned flags around the community of Bowman for occasions such as the 4th of July. At home, he enjoyed outdoor pursuits, Western and mystery films, and time spent with family and friends. The Pendarvis family thanks the community of Bowman for their support throughout his illness (notably Mr. Jimmy Weathers and Ms. Donna Kirven), the medical staff at Memorial Sloan Kettering Cancer Center in New York City especially Dr. Aaron Goldberg, Dr. Anna Price of Bowman, and Pam Crisp of Homestead Hospice. The family will receive friends from 4 to 6 p.m. on Saturday, March 9, 2019, at the residence. Funeral services will be held at 3 p.m. on Sunday, March 10, 2019, at Bowman Southern Methodist Church in Bowman. The Rev. Marvin Clark and Pastor Anthony Curcio will be officiating. Burial will follow at Bowman Memorial Cemetery in Bowman. Pallbearers will be Michael Hello, Anthony Hello, Travis Carter, Randy Boland, Jimmy Weathers and Jeff Lewis. In lieu of flowers, please make a donation to Bowman Southern Methodist Church at P.O. Box 187 Bowman, SC 29018 or Memorial Sloan Kettering Cancer Center at 1275 York Ave. New York, NY 10065 in Albert's name. DORCHESTER -- Gussie “Vicki” Braxton, of Dorchester, passed away on March 7, 2019, at her home. Wake service will be held Tuesday from 6 to 8 p.m. at St. Mark Baptist Church, Pregnall. The funeral service will be held at noon Wednesday, March 13, 2019, at Lovely Hill Baptist Center, 5905 West Jim Bilton Boulevard, St. George. Burial will be in the church cemetery. Brown & Son Funeral Home 5901 West Jim Bilton Boulevard St. George SC 843-563-4332. ORANGEBURG -- Funeral services for Mrs. Thelma L. Ritter, 71, of 2239 Shillings Bridge Road, Orangeburg, will be held at 11 a.m. Saturday, March 9, 2019, at Hickory Hill Baptist Church, 4623 Neeses Highway, Neeses. Interment will be in Macedonia Church Cemetery. The Rev. Ricky James is officiating. The body will be placed in the church one hour prior to service. Mrs. Ritter passed away on Friday, March 1, at the Regional Medical Center, Orangeburg. Visitation will be held from noon to 8 p.m. Friday, March 8. Friends may call the residence, 2239 Shillings Bridge Road, Orangeburg, or Simmons Funeral Home and Crematory of Orangeburg. EUTAWVILLE -- Lorraine Clark, 48, of Eutawville, went to be with the Lord on Saturday, March 2, 2019. Celebration of life services will be held at noon Saturday, March 9, at Mount Olive AME Church, 4630 Old State Road, Holly Hill, with the Rev. Isaac Grant, pastor, officiating. Burial will follow in the church cemetery. Visitation will be held from noon to 7 p.m. Friday, March 8, at Mount Olive Church. Lorraine leaves to cherish her sweet memories her mother, Lucille Clark; fiancé, Frankie Jenkins; two beautiful daughters, Francis (DaJohn) Grant and Bendrena Jenkins; three grandchildren, Nova, Neikko and Niyah Grant; two sisters, Heather Brown (Quincy) and Gloria Clark Choice (Larry); and a host of other relatives and friends. Funeral arrangements are entrusted to Grace Funeral Services, LLC, 8827 Old State Road, Holly Hill, SC 29059 (803 496-5539). HOLLY HILL -- Wilhemenia Olin, 56, of Holly Hill, went to be with the Lord on Friday, March 1, 2019. Celebration of life services will be held at noon Saturday, March 9, at Rock Hill AME Church, 405 Rock Hill Road, Vance, with the Rev. Robert L. Morris, pastor, officiating. Burial will follow in the church cemetery. Visitation will be held from 3 to 7 p.m. Friday, March 8, at Grace Chapel in Holly Hill. Wilhemenia leaves to cherish her sweet memories three sons, Zachary (Shammora) Olin, Anthony (Rayneisha) Olin and Antione Olin; eight grandchildren; three sisters, Dorothy Wright, Barbara Watson and Carolyn Olin; one brother, Ricky Olin; and a host of other relatives and friends. ST. GEORGE -- Madge Cuttino, 88, of St. George, passed away on Wednesday, Feb. 27, 2019, at Lancaster Convalescent Center. A memorial service will be announced at later time. Services are entrusted to Brown & Son Funeral Home, 5901 West Jim Bilton Blvd., St. George, SC (843-563-4332). BOWMAN -- Albert W. Pendarvis, 66, a lifetime resident of Bowman and retired sergeant of the Army National Guard, passed away peacefully at home Thursday, March 7, 2019, after an extended illness. Albert is survived by his high school sweetheart and loving wife of 47 years, Diane (Drawdy); his son, Michael (Pendarvis) Hello and son-in-law Anthony Hello of New York City; his niece Stacy (Drawdy) Martin and her husband, Robert Martin, of Orangeburg; Stacy's son Larry James (L.J.) Smith; and four siblings and their families. Throughout his life, Albert actively participated in the Bowman Southern Methodist Church community, including serving on its Board of Stewards, in the Cartwright Men's Fellowship, and at Adult Sunday School. Albert also led the tapes ministry program, which brought audio of church services to community members who could not attend in person. Outside of the church, Albert was a member of the Federation of the Blind, Toastmasters and the American Legion. He positioned flags around the community of Bowman for occasions such as the Fourth of July. At home, he enjoyed outdoor pursuits, Western and mystery films, and time spent with family and friends. The Pendarvis family thanks the community of Bowman for their support throughout his illness (notably Mr. Jimmy Weathers and Ms. Donna Kirven), the medical staff at Memorial Sloan Kettering Cancer Center in New York City, especially Dr. Aaron Goldberg, Dr. Anna Price of Bowman and Pam Crisp of Homestead Hospice. The family will receive friends from 4 to 6 p.m. Saturday, March 9, at the residence. Funeral services will be held at 3 p.m. Sunday, March 10, at Bowman Southern Methodist Church, Bowman. The Rev. Marvin Clark and Pastor Anthony Curcio will be officiating. Burial will follow in Bowman Memorial Gardens, Bowman. In lieu of flowers, please make a donation to Bowman Southern Methodist Church, P.O. Box 187 Bowman, SC 29018; or to Memorial Sloan Kettering Cancer Center, 1275 York Ave. New York, NY 10065, in Albert's name. ORANGEBURG -- Judith Gray Dyches, 76, of Orangeburg, passed away peacefully surrounded by her family on Wednesday, March 6, 2019. Judy was the wife of Dalton Wayne Dyches of the home. A memorial service will be held at 2 p.m. Saturday, March 9, at Dukes-Harley Funeral Home chapel, with visitation following the service. Judy was born in Orangeburg, the daughter of the late Arthur McDaniel “Mac” Gray and Thelma Jeffcoat Gray. She was a retired registered nurse and a member of Rivelon Baptist Church. Her love of the nursing profession led her to donate her body to University of South Carolina School of Medicine. Survivors include her son, Dalton Wayne “Dal” Dyches Jr. (Mary Jo) of Chapin; daughter, Tonja Dyches Chinners of Orangeburg; granddaughters, Sara Catherine Chinners of Atlanta, and Mary Margaret Dyches and Joanna Dyches, both of Chapin; a sister, Peggy Gray Felkel (Melt) of Chapin; a brother, Kenneth McArthur Gray (Linda) of Cameron; and a host of cousins, nieces and nephews. Memorials may be made to St Jude's Children's Research Hospital, 501 St. Jude Place, Memphis, TN 38105-1942. ROWESVILLE – Funeral services for Mrs. Elease E. Robinson, 77, of 2301 Bowman Branch Highway, will be held at noon Saturday, March 9, 2019, at Pineville United Methodist Church, with the Rev. Wyatt Minton III officiating. Burial will be in the church cemetery. The casket will be placed in the church at 11 a.m.
Mrs. Robinson died Friday, March 1, at her residence. Viewing will be held from noon to 8 p.m. Friday, March 8, at Glover's Funeral Home. VIRGINIA -- The funeral service for Mrs. Gertrude Holman, of Virginia, formerly of St. George, will be held at 11 a.m. Saturday, March 9, 2019, at Bethel Baptist Church, St. George, with the Rev. Lewis officiating. Friends may call at the Stevens Funeral Home. Visitation will be held on Friday from 4 to 6 p.m. at the funeral home. ORANGEBURG -- The funeral for Mr. Joseph Sims, 35, of Orangeburg, will be held at 2 p.m. Saturday, March 9, 2019, at Bushy Pond Baptist Church in Norway, with Pastor James E. Holiday officiating. Interment will follow in the church cemetery. Mr. Sims passed away Saturday, March 2, 2019. Viewing will be held from 2 to 7 p.m. Friday, March 8, at W.B. Crumel Funeral Home of North. Friends may call at the residence of his aunt, Mrs. Mary L. Burkett, 136 Maple St., Norway, and at the funeral home. ST. GEORGE -- Funeral services for Mr. Terrence Forde, 69, of 324 Lemon Grove Road, St. George, will be held at 1 p.m. on Saturday, March 9, 2019, at Freedom Worship and Praise with the Rev. Benjamin and the Rev. Collins officiating. Burial will be in the Widow Cemetery, Harleyville. Friends may call at the residence of his wife, Sylvia Forde, 324 Lemon Grove Road, St. George, or Stevens Funeral Home. Visitation will be held Saturday from 11 a.m. until the hour of service. Online condolences may be made at www.Stevensfh.net.